Coverall North America, a leading franchised brand of independent professional commercial cleaning businesses, engaged Codesummit to implement their new website and franchise portal. The old Coverall site had a poor user experience and was not mobile friendly. With a tight development timeframe, Codesummit worked closely with Coverall’s IT and Marketing teams to create responsive web pages using a client-supplied design. Built on Kentico EMS, the new Coverall site launched on time, within budget, and the new functionality integrated seamlessly with various internal systems, CRM, geolocation services, and Kentico’s email marketing features. Although it has just been launched, the new site has had an immediate impact on Coverall’s 8,000 global franchisees with automated lead generation and lead retrieval services for more than 40,000 customers in 90 metropolitan markets. The UK's largest and Europe's second largest provider of self-storage solutions, Safestore set clear goals from the beginning for their website redesign, primarily to increase business opportunities. The new Safestore website is built on Kentico EMS 8 and leverages web and telephone-based inbound customer inquiries, provides the on-site conversion rate for these inquiries, and an organic search ranking. Beyond these requirements, the site had to deliver a market-leading experience that sets Safestore ahead of its competitors. The site was a success, even after overcoming a few challenges. The design is simple, responsive, uses an intuitive rate quote process, and prioritizes presentation of store information. New technology platforms with marketing and personalization opportunities were created, including e-commerce functionalities as well as integration with Sagepay to accept payments and with Space Manager self-storage software. To improve its organic search ranking, Safestore integrated several complex back office technology systems, a product and pricing API, and an event tracking module. There, third-party systems such as an appropriate schema.org vocabulary or Lucene search engine library were implemented. The result of this effort is a sustainable search engine with friendly site structure, which has store locations built in. This project aimed to deliver a best-in-class online service for Vodafone Fiji – a division of Vodafone Global Enterprise Limited. Some challenges appeared during the project, including the need to migrate unstructured content and customer data from the previous website and integrate it all with Vodafone’s core systems. This new integration offers a lot of features, including mobile number validation, a customer portal, top-up of prepaid mobile phones, Vodafone’s Mpaisa payment system, credit card payment processing, and voicemail services. As Rajnesh Prasad, Vodafone Fiji Chief Marketing Officer notes: "The new website will allow customers to track their usage and check their balances and accounts in real time." All website development was part of a new customer-focused Vodafone Fiji online strategy. The main focus was in improving findability, context, and relevance for customers. They are now given easy access to the information they need. The site is fully responsive, enables chat services, forums, and social media integration. Specifically, the site uses Kentico’s custom tables, forms, and bulk emailing features for bill notification. Tribes is a premium provider of workplaces, flexible, or virtual offices. Tribes is a company with big ambitions and considers itself a premium brand, which had to be reflected in the overall look and feel of their website. They were inspired by the 34 remaining indigenous tribes around the world (e.g. Maasai, Kazakh, Maori, etc. ), and consequently made a decision to give every office location a different tribe as a concept theme. Founder Marcel Boekhoorn explained this use of tribal themes: “I’ve started exploring them and found a treasure of wisdom. I wanted to share that wisdom with you. That is the actual story of Tribes.” Kentico was integrated with Ingenico, an online payment tool to sell memberships, and an automated a meeting room reservation system linked to Salesforce. There is also a plan to add many more features in the later stages of the project. The site received a lot of good feedback; the bounce rate dropped considerably, and the average time spent per visitor increased significantly. Founded in 1887, Marks & Clerk is an international firm of trademark and patent attorneys. Their services are provided in nine countries around the world, so the site had to give a genuine voice to all global offices through engaging content, while providing local expertise where appropriate. The site serves as a comprehensive thought leadership and knowledge base publication, as well as a management mechanism. It needed a personnel search facility with context-sensitive options. Last but not least, the site needed to engage visitors with intelligent, dynamic, and multilingual content. The site achieved its objectives. In December 2015, the site saw a 92% increase in new users, an 88% increase in visitors, and an almost 29% increase in page views. In line with the site’s global reach objectives, the United States, Singapore, Germany, Hong Kong, India, and Japan now feature strongly in the top 10 countries from which these visitors come. What’s the best way to drive traffic and donations by developing an authentic and inspiring online presence? That’s a question that Women’s College Hospital Foundation (WCHF) can answer. They are a non-profit organization focused on using donations to support new models of medical care that dramatically improve the health of women, girls, and their families. Using Kentico EMS 8, this implementation allowed WCHF to manage their online presence and publish engaging content (e.g., a mixture of curated and dynamic content, blogs, and event calendars) easily. An inspiring online presence with SEO optimization was created, including the latest UI best practices, and all integrated as seamlessly as possible with the Blackbaud online donation system. Since the site’s launch, WCHF has seen a 172% increase in sessions and a 168% year-on-year increase in users. For 70 years, True Manufacturing has exceeded standards in refrigeration equipment. They wanted a website that showcased the quality of their products and the company‘s time-tested reputation. Because the website needed to correspond to True’s state-of-the-art technologies and innovative approach, the goals of the site design were clear. Responsive designs and fresh visuals were important requirements. Visitors can now find desired products, view all video guides and product documentation, and reach support staff easily. Using Kentico 8.2, the SEO-optimized site satisfies both English and Spanish speaking customers and entrepreneurs. Canrefer is an online cancer services directory developed for the Cancer Institute NSW, which is dedicated to lessening the impact of cancer. Based on Kentico EMS, Canrefer lists specialists, hospitals, and services that provide diagnosis and treatment for people who suspect they have or are diagnosed with cancer. The goals of the site were to develop an extremely easy to use and powerful tool to help this constituency find helpful and appropriate resources by service and location quickly, through the use of maps and filters. Because the search facility is the centerpiece of the site, the search tool went through many rounds of refinement to achieve perfect results and relies heavily on geographic data. Furthermore, because the Cancer Institute is a government organization, developers weren‘t allowed to have access to the production environment. Uploads had to be packaged and released in staged deployments. The website deployed user-generated content to allow extra registered users to update pages, and also contains a contact logging feature to enable “recently visited pages". Glacier Park Inc. has served thousands of visitors for decades, but their team lives, works, and plays in Northwest Montana all year long. It was quite clear that they wanted to have a website with a captivating online experience that encourages users to make reservations. The site underwent a complete redesign of mobile and UX features to impress potential clients. The site integrates with Glacier Park’s hotel reservation system and provides users with custom weather information, social sharing, and Google Maps integration. All potential visitors have the ability to share their experience through a custom rating widget. The redesigned site saw a substantial 60% increase in time-on-site and a 12% decrease in bounce rate. Just One Day is a new fundraising campaign from the humanitarian development organization International Needs Australia. The initiative is aimed at primary school students in Australia, encouraging them to “live simply for just one day to help keep poor kids in school.” The goals of the website were to promote this new initiative and to collect funds raised online. Because the participants are mostly children, International Needs Australia was collecting cash offline, using a receipt book. The challenge was providing a facility to submit those funds via the website. Heartburst’s solution was to use the donation product type in Kentico’s E-commerce solution to add attribute options to the product to allow the collection of additional data such as “receipt book number,” and “participant name,” via the checkout. The campaign has received a fantastic response, with over 5000 students already registered to participate in the program in April 2016. With this many participants, International Needs Australia are on track to meet their fundraising goal for this campaign! We are happy to announce a fresh opportunity to promote your hard work. Share your story of how Kentico helped you and your customers achieve success! More information is available here. 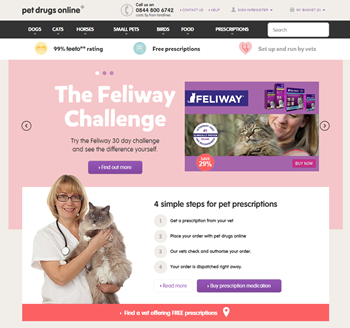 Established and run by qualified veterinarians, Pet Drugs Online supplies prescription and non-prescription medication, accessories, and food products directly to pet owners. This business model offers a cost-effective alternative to buying directly from traditional veterinary practices. The aim of the site was to implement a new ERP system to cope with increased orders and build a class-leading website to ensure and accelerate growth, including migrating thousands of user records from the old site as seamlessly as possible. The site has been optimized for search and built with tracking in place to deliver advanced e-commerce analytics. The overall success of the website resulted in an 80% increase in time visitors spend on the site. Year-on-year sales went up 65%! True Digital created a new logo and visual identity, which received an overwhelmingly positive response. There was a 31% increase in total sales, a 30% increase in orders, and a 27% increase in site visits. True Digital also dedicated a lot of time to user testing and checkout processes refinement to guarantee the most streamlined visitor journey and define a new site structure and information architecture. The site was developed using MVC to give users complete control over the markup delivered to the browser, ensuring a semantic markup with optimum performance. True Digital used Amazon S3 as a CDN for the hosting product, prescription, and pet images, ensuring that images and pages load as quickly as possible. The solution was also integrated with third-party providers such as Khaos Control ERP, the Feefo review tool, and payment systems Sagepay and Paypal. Read more in case study.